Steve Bannon will not face charges related to his registration to vote in Miami despite spending most of his time elsewhere, prosecutors announced. 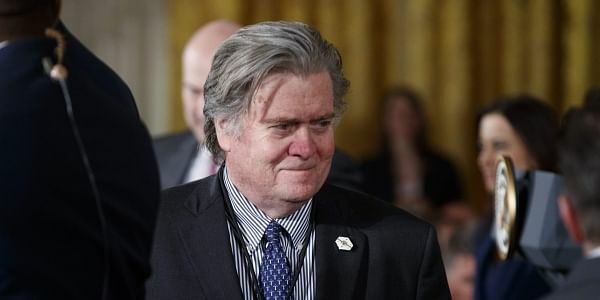 MIAMI: President Donald Trump's senior adviser Steve Bannon will not face charges related to his registration to vote in Miami despite spending most of his time elsewhere, Florida prosecutors announced Thursday. The Miami-Dade County State Attorney's Office concluded in a memo that there was not enough evidence to prove any crime. Bannon registered to vote in the county on April 2, 2014 after leasing the first of two houses in Miami's Coconut Grove neighborhood, then switched his registration to the Sarasota area last year. Bannon never voted in Miami-Dade County, the prosecutors said. They also said there was insufficient evidence to prove Bannon falsely claimed to reside in Florida on a voter registration form, which is a felony. The memo says the amount of time a person spends at a given address is not proof alone of residence. Bannon spent much time while registered to vote in Florida in other states, most notably California and New York. "Especially in our increasingly mobile society, a person may spend the majority of his or her nights at one (or multiple) locations, but legally reside at another under Florida law," the memo says. "The old adage of 'where you lay your head is home' is only part of the residency analysis." Lawyers for Bannon didn't immediately respond to emails seeking comment. But in the memo, attorneys Thomas Scott and Ed Pozzuoli were quoted as telling investigators they had reviewed the matter and found "no actionable conduct" by Bannon. The investigation by the prosecutor's Public Corruption Unit found that Bannon first leased a home in Coconut Grove in April 2014 along with his ex-wife, Diane Clohesy. Clohesy told prosecutors that Bannon did stay in the house from time to time between 2014 and 2016. Bannon's office paid the rent and records also showed his name was on the lease and on another lease for a separate home in the same area, which he rented in January 2015. Bannon also took out accounts with utilities in his name for those residences. Miami political consultant A.J. Delgado told investigators she met with Bannon at the first home and saw "boxes, papers and effects in the house that indicated to her that (he) was living at the house." Delgado also said Bannon referred to the place as "my house." Bannon also had an active California driver's license, the investigation revealed, but the address had not been updated since March 2013. Bannon also was linked to several other properties in New York and California but none were listed as his main residence for tax reasons, the memo says. To prove a violation, prosecutors concluded they would have to prove Bannon did not intend to live in Miami-Dade County when he originally registered to vote in 2014. "The investigation did not uncover sufficient evidence to do so," they wrote.